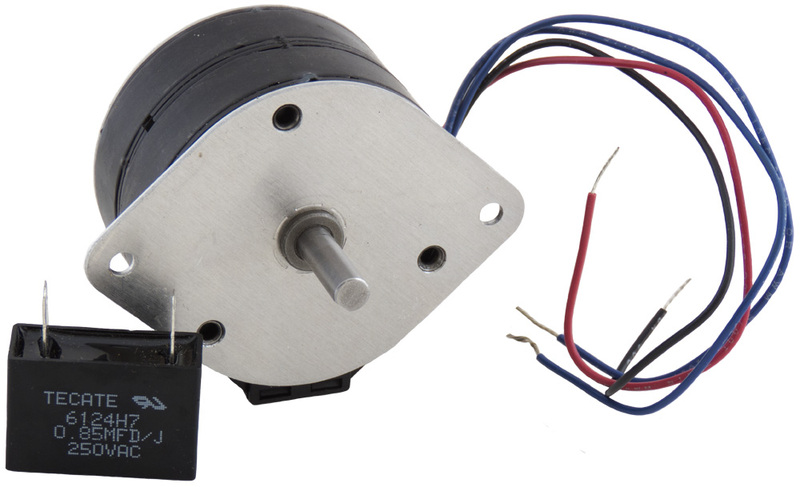 Hurst reversible direct drive motor. Permanent magnet AC synchronous. 115v AC, 300 rpm, 60 Hz, 9 watt. 10.2 oz/in torque. Ball bearings. Series 59mm. 1/4" x 3/4" "D" shaft. 2.62" c-c- mount holes on diamond plate. ZP style, model SC. 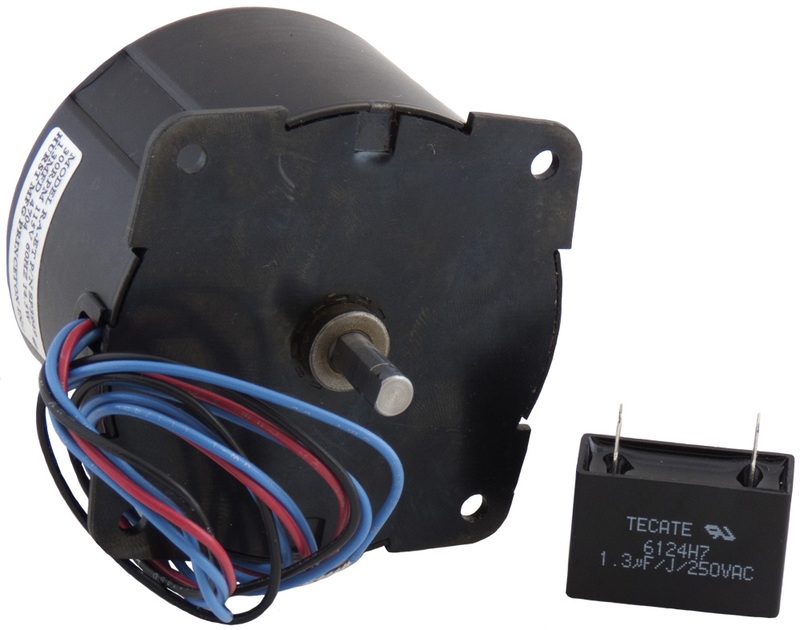 0.85 uf, 250v AC cap included. 30 pc/case. 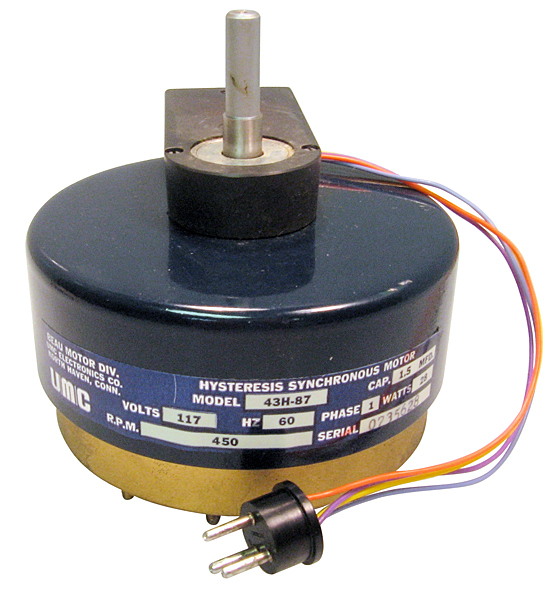 Motronics hysteresis synchronous motor. 1800 rpm. 115v, 60 Hz, 0.007 HP. 3-5/16" diameter body x 4-1/8" long. Stepped shaft - 0.21", 0.275", 0.479" diameter. 2.125" overall length. Harris P/N: 436-0117-000. Beau Motor Div. 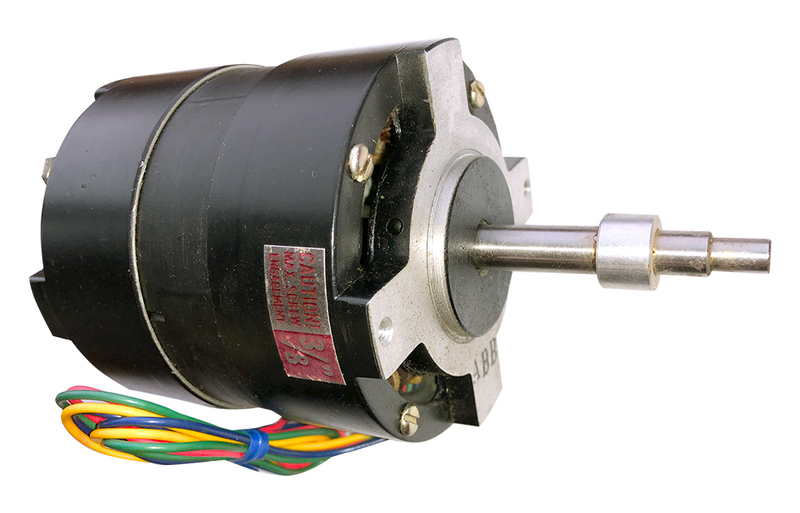 synchronous tape drive motor. 117 vac, 60Hz, 40 watts, 1 phase. 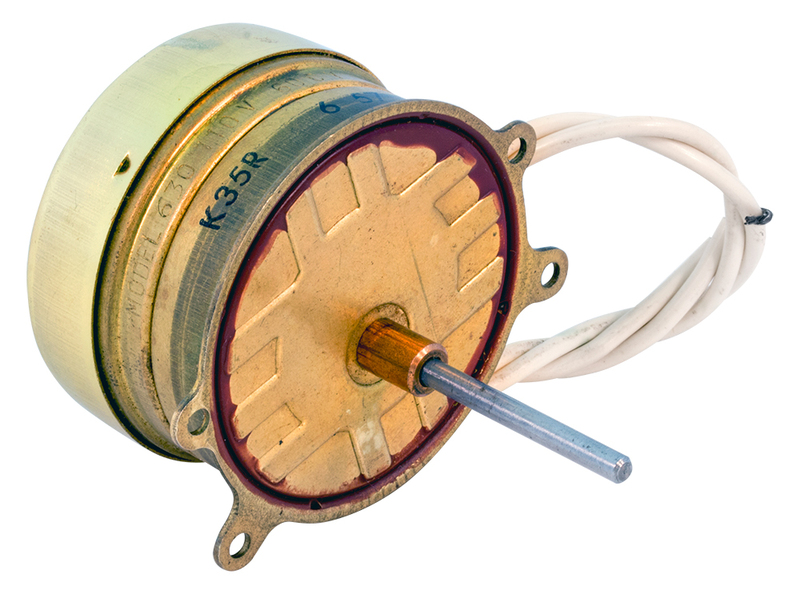 3 speed (450 - 1800 rpm) reversible. 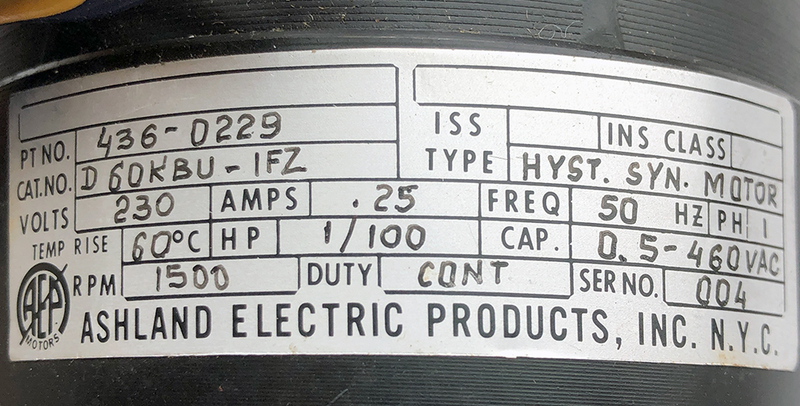 Requires 2.5 µF capacitor. 4" diameter body x 5/16" x 1" shaft. Harris P/N: 436-0126-000. 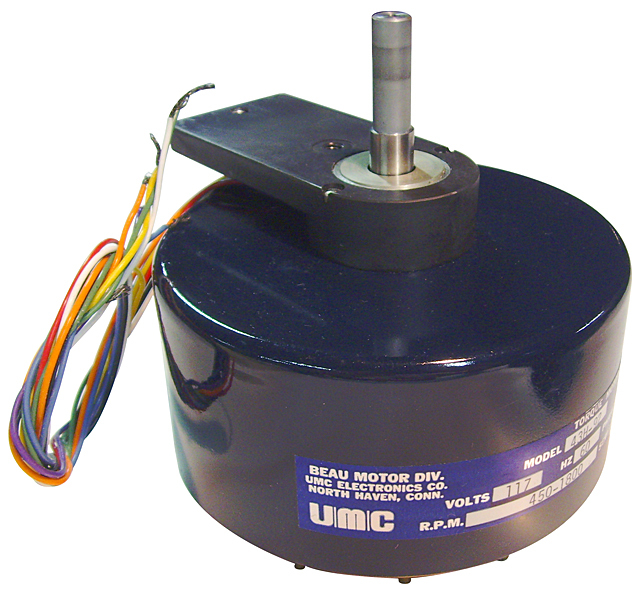 Beau hysteresis synchronous motor. 450 rpm. 117 vac, 60 Hz, 28 watts. 3-7/8" diameter body x 2-1/4" long. Shaft measures 0.332" diameter x 1.25" long. 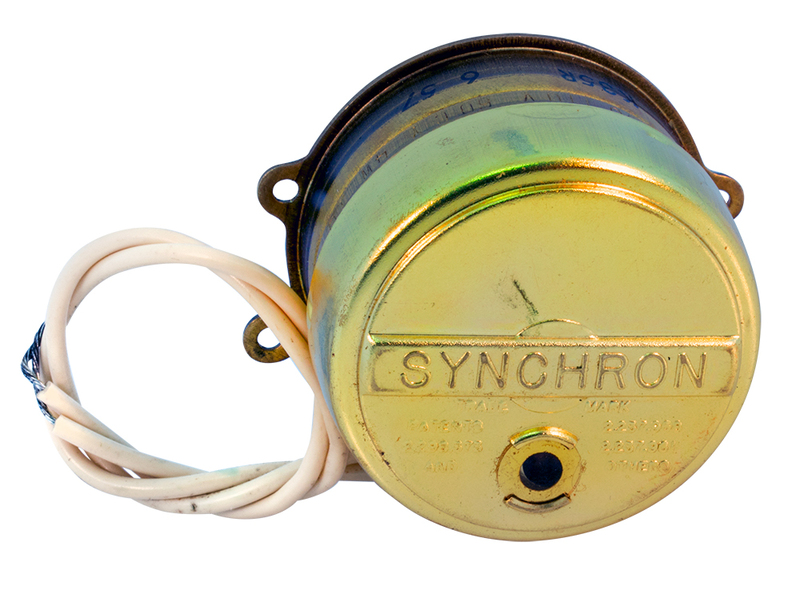 Synchron Model 630 synchronous motor. 10 rpm, 110v @ 60 Hz. 1.48"D x 0.83"H body. 0.120"D x 1.14"L "D" shaft. 1.53" x 0.29" mounting centers. UL & CSA listed. 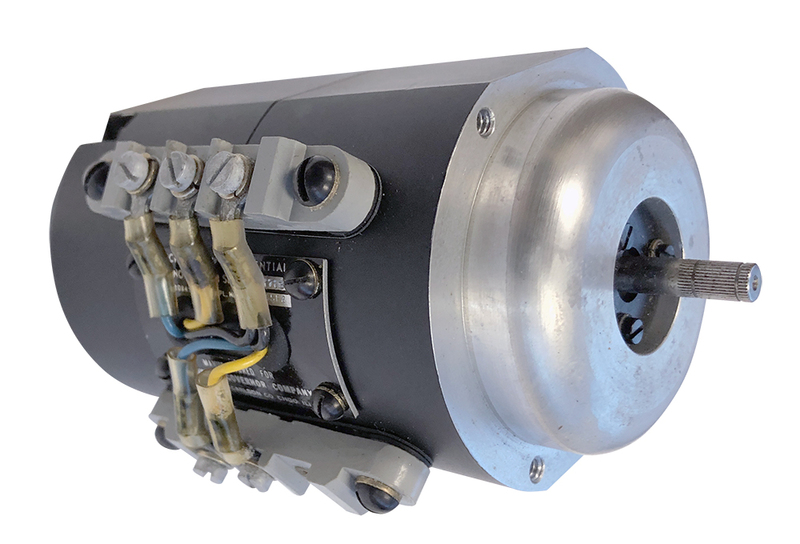 Bodine 230v synchronous projector motors are the cats meow for many projects, not the least of which is replacements for theater projector motors. They achieve and lock in at 1200 rpm! 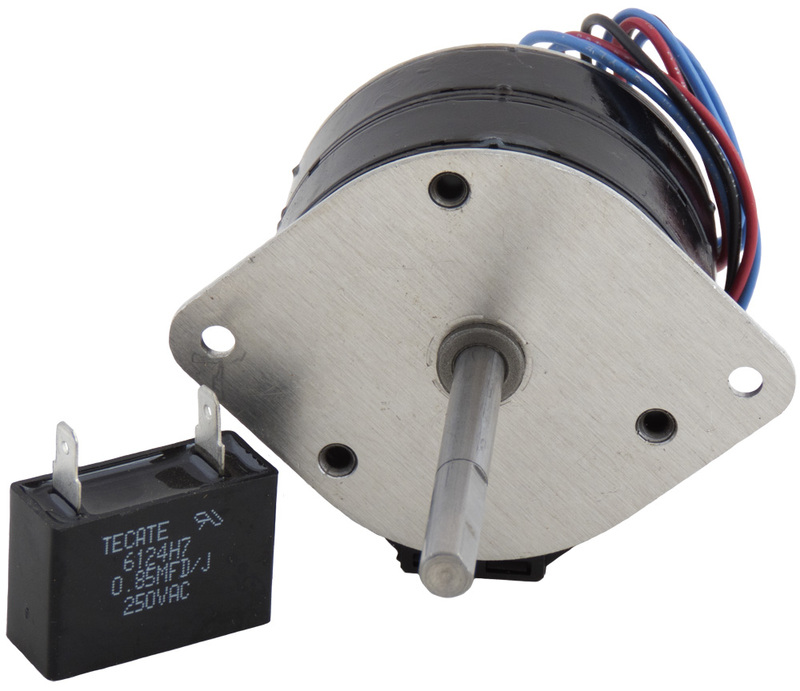 When operated in reverse, or when the shaft is driven by a wind propeller, once 1200 rpm is achieved, the voltage and frequency output is constant regardless of small speed variations. Most generators have a transmission to convert prop rotations to generator requirements. 5.5" diameter x 7.5" long body. Type 48Y6BFYP, 1200 rpm, 1/5 hp, 230 vac, 3 phase 60 Hz, 2.3 amps. Shaft is 5/8" diameter x 2-1/2" long. Great for wind generators! Bodine projector motor identical to left but 208v, 3 phase. 1200 rpm, 2.3 amp. Shaft is 5/8" diameter x 2-1/2" long. Great for wind generators! 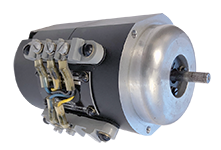 Bodine projector motor physically identical to left but 1000 rpm continuous duty, 380v, 1.3 amp, 50 Hz, 1/5 hp, 3 phase. Shaft is flatted, 5/8" diameter. Great for wind generators! 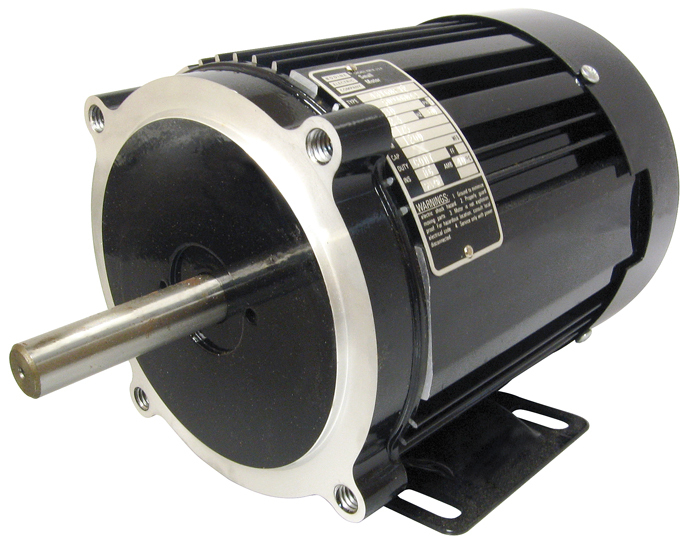 A selsyn, or synchro is a motor which when wired to one another and the shaft rotates, the other shaft rotates in synchrony, keeping a constant angular position relationship with the first shaft. Packaged in vacuum cans from 1954! 90 / 55 vac, 60 Hz. Synchronous for "U.S. Navy Bureau of Ordinance", maybe a torpedo or radar? Made by Magnovox. Can marked "Type 1 HCT Mark II Mod 5". 3/16" threaded shaft with nut will mount up to anything. 2-1/8" diameter, 3-3/8" long body. 1.25 pounds each. We were very excited to find these. Only about 60 left. Synchro transmitter 115 / 90 vac 3 amps 22w 60 Hz. MK. 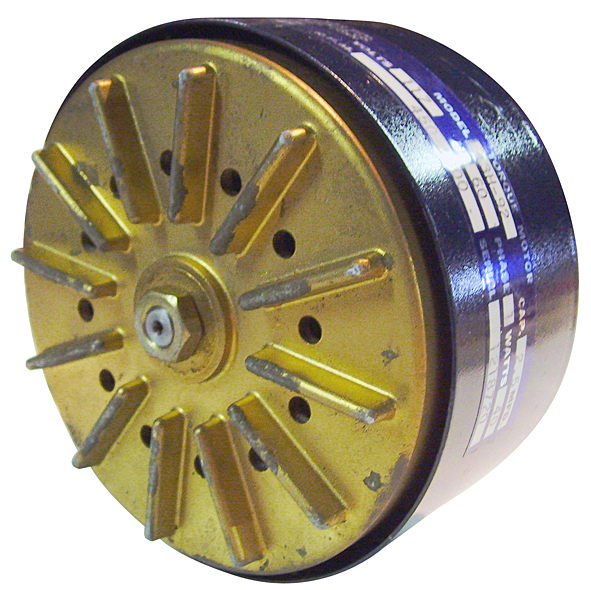 9 MOD 1 Type 7HG, 5-7/8" diameter x 9" long, 18 pounds. 1/4" threaded end tapered shaft. 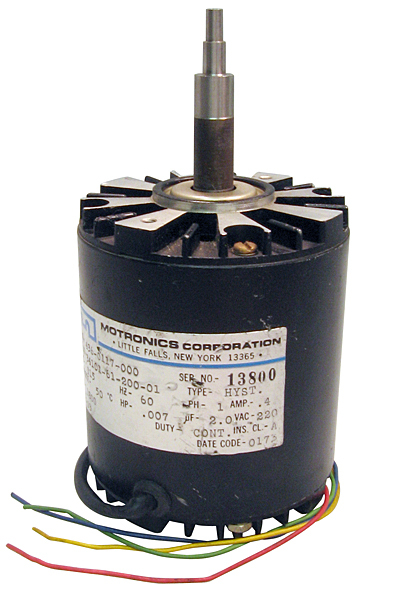 Motors are used / removed. Gov't price is $1570 each. Sold as is, not tested. 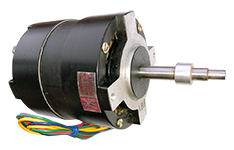 Ashland hysteresis synchronous motor. 1500 rpm, 230v AC, 50 Hz, 1 phase, 1/100 HP. 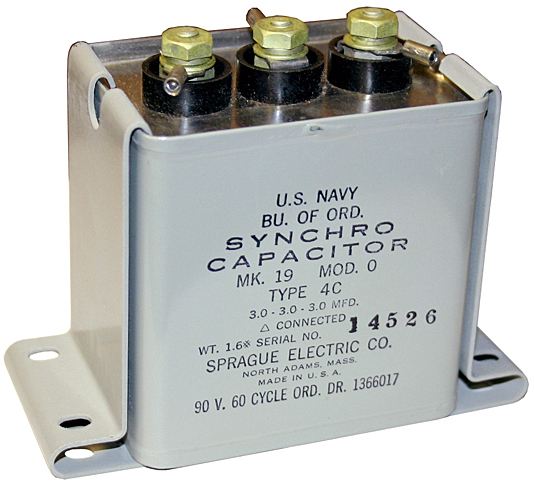 Requires capacitor 0.5 µF, 460v AC. 3-1/4"D x 3-1/2"L. 2"L shaft. 3" center on threaded mounting hole. Back in stock!! We have sold out of these twice! 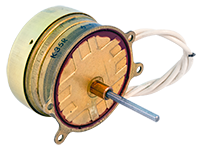 Woodward Governor Co. synchronous differential motor. Circa 1964. 2-1/4"D x 3-3/4"L body. 0.193"D x 0.5"L spline shaft. 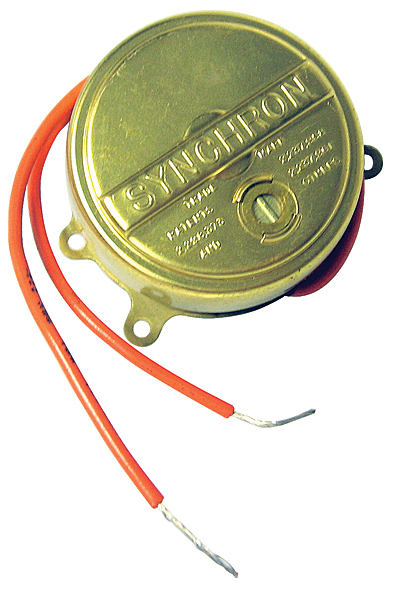 Sprague synchro capacitor. 3 µF x 3 (triple), 90v, 60 cycle with two mounting brackets. Mk 19, Mod 0, Type 4C. 2-1/4"W x 3-3/8"L x 3-3/4"H. NSN: 5910-00-052-5876. General Electric selsyn generator. Model 2J5H1. 115-105v @ 60Hz. Gear is 4-1/2" diameter, 69 teeth. 3-1/2"D x 6"L.